Japanese Hand Craft owner blog: What's Kutani? 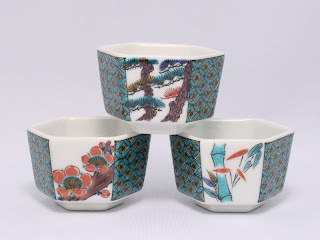 The history of Kutani pottery traces back to the beginning of the Edo period (1655). The early stage progressed under the support of the Daishoji clan. After the discovery of the potter’s clay at a mine near Kutani village, a potter was sent to Arita (Imari) district to master ceramics. He brought his techniques back to Kutani, but production suddenly ended around 1700. The cause of the decline is still unknown. About eighty years later the Kasugayama kiln opened at Kanazawa under the control of the Kaga Clan. A lot of kilns were built and each developed their own special style. In the Meiji period (1868-1912), Shoza Kutani developed his unique style, and the works of his apprentices were exported as highly valued examples of Industrial Arts of Kutani. Asian culture always impresses me! Everything is so beautiful and full of secret deep sense!